December is here and with it, all the magic of the season. I LOVE December, especially since moving to the (very cold) countryside. The mornings are crisp and misty, the woodsmoke curling out of chimneys into the cold air and frost whorls on the tops of the gateposts. Our house is filled with pine trees, candles and decorations and my thoughts are turned to giving and celebrating. It occurred to me the other day that here in the (protestant) UK we don't celebrate enough these days. Other cultures and religions have all sorts of wonderful feasts and festivals that we just don't have, and I think we miss out on a lot of things because of it. We live in a full world - full of information, full of adverts, full of pressure to be what the internet tells us we should be - and I feel my world should be full of quiet moments with those I love. I'm currently re-reading the Morville Hours, a gorgeous book that talks about the life of the garden with reference to the daily routine of the medieval Book of Hours and the yearly rhythm of the church festivals - the seasonal revels that are largely forgotten, that marked the year as it turned. Living now in the heart of the countryside, with a view that changes every morning as the seasons pass, I am much more in touch with nature than I ever have been. Now I can see the night sky, uninhibited by cranes raising up blocks of flats, each full moon seems like a gift, each sunrise something to be thankful for. 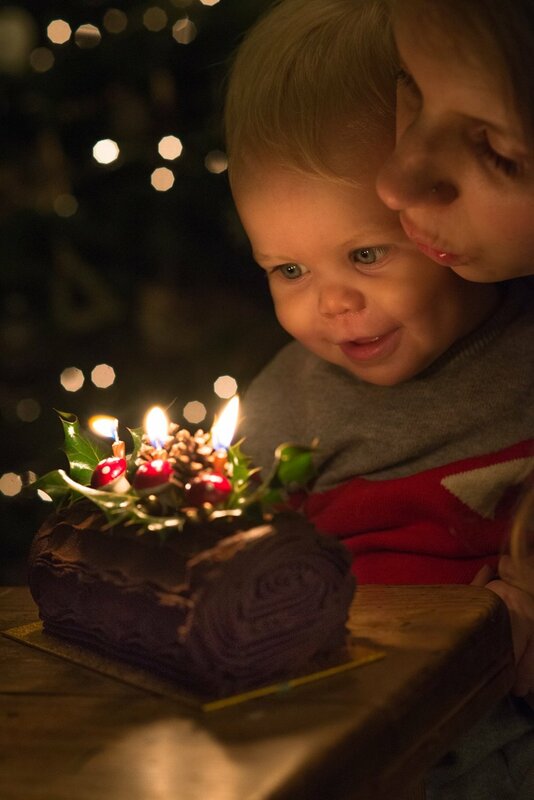 It's made me want to give Imogen that sense of joy and anticipation that these festivities bring, and I've begun to think of what we could be celebrating that we currently don't. ~ Last Year's Yule Log ~ - I'd like to pretend I made this but Immy was a very clingy baby at the time - we decided to try this year though! Midwinter, midsummer and the equinoxes. The feasts of St Nicholas and St Lucy, which have both enchanted me since childhood. Thanksgiving and Harvest. Passover and May Day. I don't want to forget these important occasions in the hustle and bustle of modern life. So last night, our Dutch friend Naomi came over for Sinterklaas (St Nicholas) - we exchanged gifts, ate kruidnoten and had supper together. On the 13th we'll light candles for St Lucy and I'll attempt to make saffron buns! Plus of course all the normal celebrations of the solstice and Christmas, with their promises of light, new starts and gifts of hope. ~ Opening the Advent Calendar ~ - Tiny baby Immy a year ago! These days will be moments of calm and family time in a busy month full of wreath workshops, shopping and crafting. Time to spend together and reflect on the year that's been and the year that's to come. I can't wait! ** Beautiful cover image shameless stolen from John Spurr Photography. He's married to me so hopefully I'm forgiven!